BROSSARD, QUEBEC, CANADA – January 29, 2018. Alliance Magnesium Inc. is proud to announce the appointment of Mr. Salvatore Vitale, CPA as Chief Financial Officer of the company. Mr. Vitale has 20 years of corporate finance experience in a variety of industries including transportation, manufacturing and mining. During his career, Mr. Vitale has been CFO of several Canadian companies, including Transforce, Blackrock Metals and Group Dynamite. Mr. Vitale has extensive experience and knowledge of mergers and acquisitions, capital raising, profit improvement and turnaround. Mr. Salvatore holds a Bachelor of Accounting degree from Concordia University and is a CPA Certified Professional Accountant. “We are very pleased to have Salvatore’s experience with Alliance Magnesium,” said Dr. Joel Fournier, President of Alliance Magnesium. “In this crucial period of our development, it will be an important asset in the management of finances and the raising of capital. ” he added. 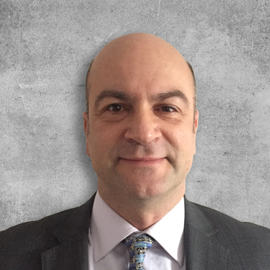 Salvatore Vitale joins a team of experienced managers and renowned scientists, fully dedicated to the achievement of Alliance Magnesium objectives. Brossard, Quebec, Canada December 5, 2017. – ALLIANCE MAGNESIUM INC. (“AMI”) is pleased to announce that it has acquired all the shares of Magnola Metallurgy Inc. and Magnola Mining Inc. (“Magnola”). The transaction gives AMI full ownership of Magnola’s industrial and mining sites in Danville, Quebec. The site includes facilities and equipment from the former magnesium plant, whose value was recently estimated by an independent appraiser at more than CAD $85 million. The property also contains a valuable residue deposit estimated at more than 100 million tons of serpentine rock, the raw material that AMI will use in its production, which is made up of approximately 25% magnesium. “It took five years of work, investment and achievement to reach this crucial and defining milestone in AMI’s development,” said Dr. Joël Fournier, Chief Executive Officer, AMI. “The transaction marks the company’s clear intention to play a dominant role in global magnesium production, and confirms its position as one of the largest manufacturing projects in Canada,” he added. The acquisition of Magnola provides AMI with the infrastructure needed to deploy the construction and operation of a 50,000-tonne magnesium plant by 2021 and create more than 350 direct jobs. After achieving a successful pilot plant, Alliance Magnesium is in technical and financial preparation for its commercial demonstration phase I which requires an investment of over CAD $100 million and will create 70 direct jobs. AMI would like to thank all its financial and governmental partners, leaders and employees for their contribution to this extraordinary achievement. AMI also wishes to thank the elected officials and citizens of the MRC des Sources for their support and welcoming of this ambitious project from its beginning and which has now become a reality. 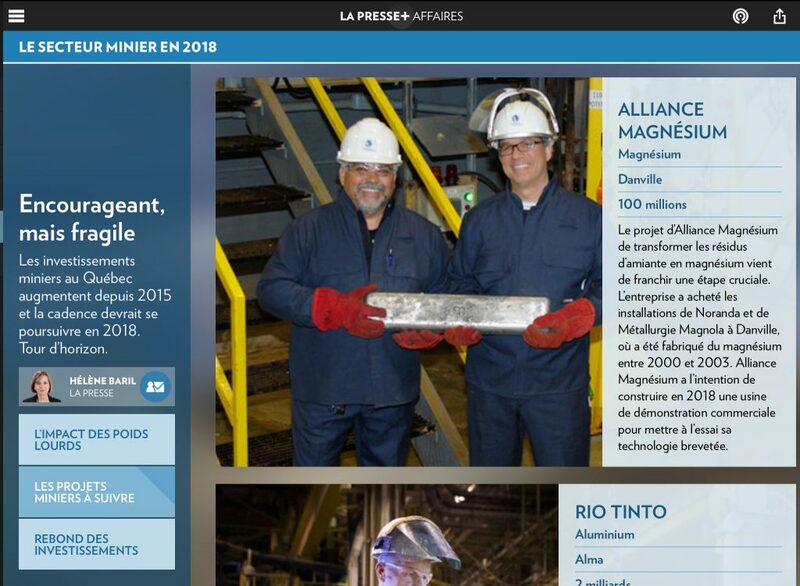 Alliance Magnesium is a privately-owned Canadian company engaged in the production of magnesium metal and other valuable minerals from serpentine. AMI has developed an innovative technology and process that gives it a cleaner and less expensive approach than those currently used worldwide by magnesium producers. The new AMI process is an alternative to the thermal process, which is one of the most important sources of CO2 emissions in the world. Brossard, Quebec, Canada, November 29, 2017 – ALLIANCE MAGNESIUM INC. (“AMI”) is pleased to announce that it has received the acceptance of its Canadian patent application for its hydrometallurgical process to produce pure magnesium and various by-products from rock-serpentine. The notice, issued by the Canadian Intellectual Property Office for its patent application CA 2954938, confers on AMI the exclusive use of its technology on the Canadian production of magnesium and other products using serpentine as a raw material. 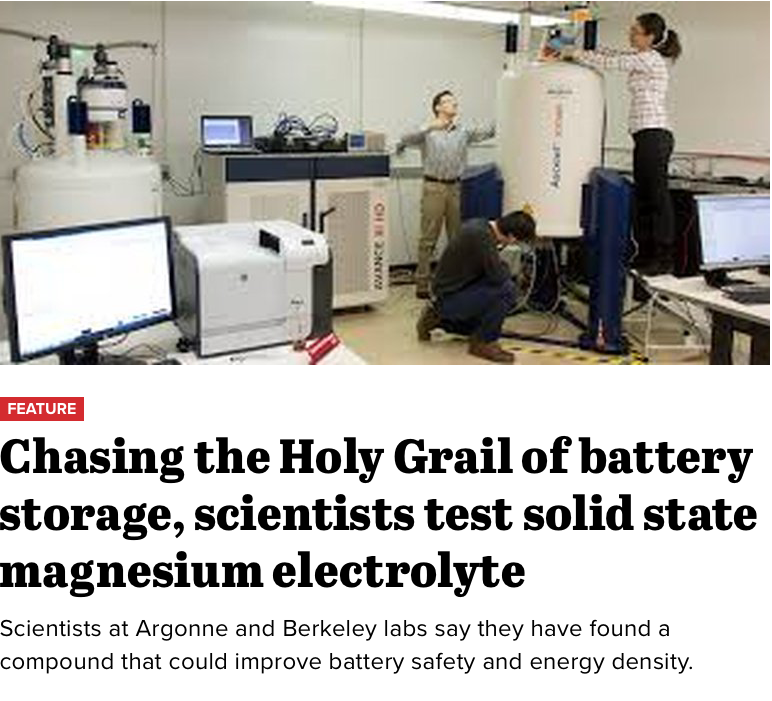 This patent protects AMI against any commercial attempt at analogous technological development of magnesium production and various by-products. “We consider this patent as the flagship for our technology,” said Dr. Joel Fournier, Chief Executive Officer of AMI. “We are very proud of the technical progress we have made over the last five years, which has resulted in a successful Pilot Plant. The Patent provides AMI with the protection it needs to continue its business model, including the ongoing deployment of its commercial demonstration Plant valued at more than $ 100 million”, added Dr. Fournier. AMI currently has five patent families in its intellectual property portfolio. The granting of this patent in Canada constitutes the first of several similar patent acceptances AMI expects in the coming months from other jurisdictions around the world.